Free Movie Theatre showing | Flecks of... Gray? 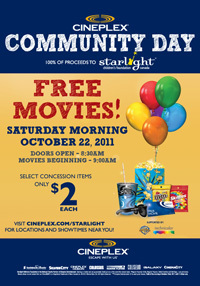 Across Canada, Cineplex theatres are having a free morning showing on Saturday, Oct 22nd for a variety of movies and snacks are just $2 each; proceeds go to the Starlight Children’s Foundation. Check out the promo listing page to find your nearest theatre and the movies that are going to be playing.